Halloween 2011 I wanted to be someone that would make people laugh which I definitely did. 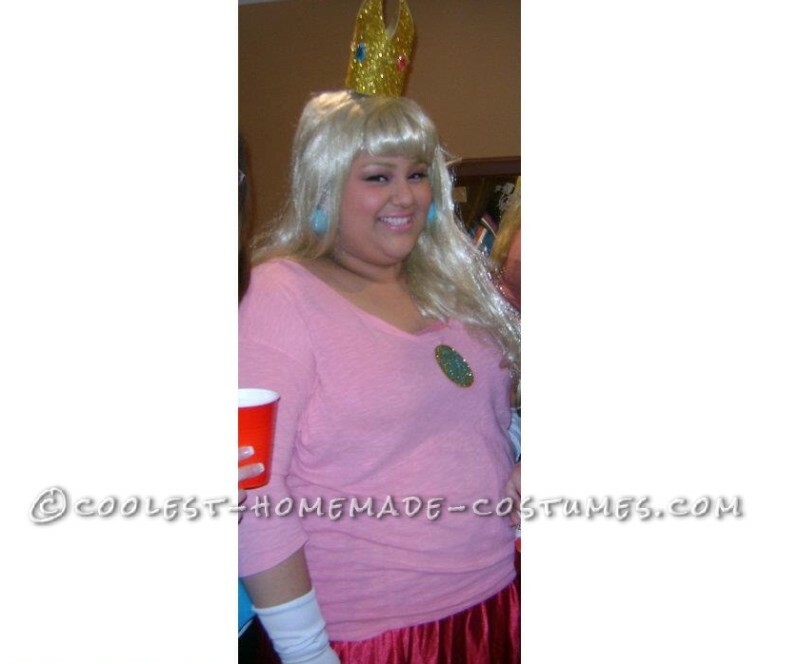 I decided to make my costume and become Princess Peach. 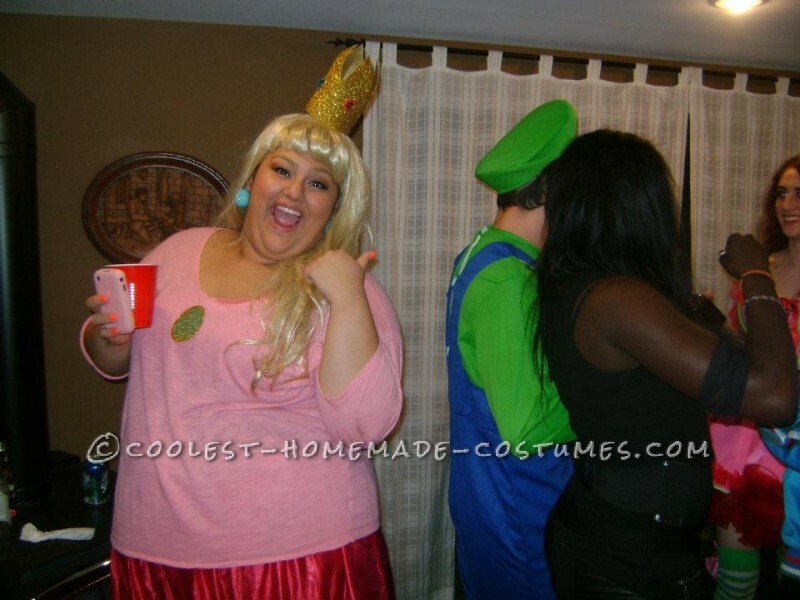 You occasionally see the Mario and Luigi costumes at parties and I thought it would be funny if I showed up as Princess Peach. To make this costume was fairly easy. I went thrifting to find a pink skirt. I found one that was for a dollar which was a steal. I then paired the skirt with a pink shirt (which I already had). I then bought white gloves and a blond long wig from a Halloween store. Now to make the jewel, the crown and earnings I visited a Michaels and bought gold glittery foam paper, jewels (blue and pink) , 2 small Styrofoam balls, some glue (for glue gun), earing attachments and some blue paint. First I painted the balls blue and hot glued an earing attachment onto them. For the jewel I cut an oval shape of the glittery paper and painted a smaller circle in it with the color blue. I then hot glued it to a pin and placed in the middle of my shirt. For the crown cut a long rectangular shape out of the foam paper and drew out 3-4 up side down triangles and cut them out. By doing so I was left with a nice crown shape. Next I hot glued on 2 pink and 2 blue jewels making a pattern onto the crown. To fill in the spaces between each jewel I cut out small/long strips and glued them in between each jewel. To seal the crown I glued the sides to make a crown and hot glue gun bobby pins to attach to my wig . Overall it wasn’t hard and I spent probably 40 ish to 50 dollars for everything! Which I think is good cause costumes can really be expensive. To my surprise everybody loved my costume, got tons of laughs and pictures and best part … there was a Luigi at the party making the night even more hilarious.